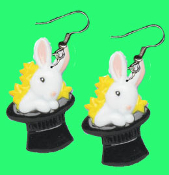 Huge Funky BUNNY in BLACK MAGIC HAT EARRINGS - Spring Easter Garden Animal White Rabbit Magician Costume Jewelry - Big Dimensional Front Flat Back Plastic Toy Charm, approx. 1.75-inch (4.38cm) tall x 1-1/8-inch (2.81cm) wide. Watch me pull a rabbit out of my hat!